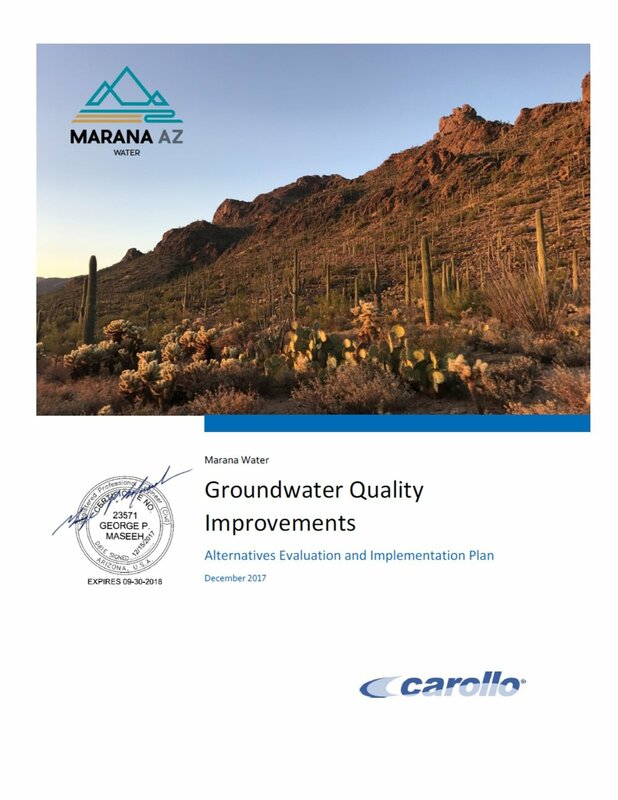 To continue providing high quality service and product to our customers, in 2016 Marana Water began a voluntary water sampling program to test for the unregulated compounds 1,4-dioxane and PFAs. By clicking on the image below, it will take you to a page showing the sampling results for each of the Marana Water systems. We have been continually collecting samples since October 2016 for both the PFAs and 1,4-dioxane. Each system has an individual chart showing the results over time and the health advisory levels. Click this link or on the image to the right for the the Groundwater Quality Improvement Report prepared in December 2017. What is PFOA and PFOS? How is it used? PFOA and PFOS are part of a larger group of chemicals called per- and polyfluoroalkyl substances (PFAs) that were widely used in commercial products. They have a strong ability to repel other compounds so they were commonly used as stain protection on fabrics and clothing, non-stick cookware, furniture protection, paper food packaging protection (i.e. microwave popcorn bags, to-go food containers, etc. ), as well as in firefighting foams. Most of the companies that use these compounds have phased out their use over the last ten years. However, because the compounds are highly stable and resistant to breakdown, they are commonly still found in the environment. how can PFOA and PFOS in the water affect my health? The USEPA is continually testing and researching the likelihood that these compounds can be harmful in drinking water. While the research continues, the USEPA has established a lifetime health advisory of 70 parts per trillion for combined concentrations of PFOA and PFOS in order to protect the most sensitive populations: fetuses during pregnancy and breastfed and/or formula-fed infants. Those included in the sensitive populations who consume water from a water system that has shown PFAs levels greater than the health advisory, you may want to take steps to limit or avoid consumption of water directly from the tap. While the department works on the next steps to address this issue, you may be able to treat water at home to reduce the levels of these compounds. What can i do to reduce my exposure to PFAs? With respect to PFAs, there are two types of treatment that have shown to be somewhat effective in reducing or eliminating these compounds from the water. These treatments are activated carbon and reverse osmosis. Activated carbon filters are relatively common and can be found at most grocery stores and home improvement stores. Examples of these devices are filtering water pitchers and in-line refrigerator filters. Use of these devices has shown a positive effect in reducing or eliminating PFAs, as well as others. Here is a link to a study using University of Arizona research showing the effectiveness of a few of these devices. All in home treatment devices require consistent maintenance and care in order to remain effective. If you would like to contact the Arizona Department of Environmental Quality (ADEQ) regarding unregulated compounds, click here. What is 1,4-dioxane? How is it used? 1,4-dioxane is solvent stabilizer that is commonly used with other chemicals and products such as paints and waxes. It is also found in many regular household items such as shampoos, colognes, perfumes, and even some food products. how can 1,4-dioxane in the water affect my health? Toxicological studies have yet to positively prove 1,4-dioxane is carcinogenic. However, the EPA is currently studying the effects of 1,4-dioxane in drinking water. They currently believe it is "likely" to cause cancer with long term exposure, though not definitive. The current guideline for drinking water is on a calculated risk potential that a person may have a one in one million chance for a health affect after drinking 2 liters per day for 70 years of water that is at or above a concentration of 0.35 ppb. What can i do to reduce my exposure to 1,4-dioxane? Since it is so widely used in common household products, people are exposed to 1,4-dioxane in many areas of their lives. Review the list of compounds included in personal care and household products to identify if they contain any of the following words: PEG, Polyethylene, Polyethylene Glycol, Polyoxyethylene, -oxynol, -eth. Exposure to 1,4-dioxane can often be associated with the use of personal care products that contain these types of ingredients.